Stein and Parini draw different ethical boundaries around a memoirist’s artistic license, but both judge the writing on its literary merit. Does it have complex characters, dramatic tension, and compelling themes? Does it ring true? These questions concern the text, independent of the author’s experience. All non-fiction writers manipulate the jumble of their available material into a recognizable narrative arc. Like Steinbeck and Frey, the more reckless architects simply fabricate larger sections, but all construct their stories such that audiences can pass through them and be transformed. After disemboweling Frey, Oprah confronted his publisher, Nan Talese. The two women crossed swords over a publisher’s ethical responsibilities, a reader’s basic entitlements, and the definition of the term “memoir,” but they stood together on the cardinal issue: fact or fiction, both were spellbound by the story. Nan: A novel is something different than a memoir. And a memoir is different from an autobiography. A memoir is an author’s remembrance of a certain period in his life. Now, the responsibility, as far as I am concerned, is does it strike me as valid? Does it strike me as authentic? I mean, I’m sent things all the time and I think they’re not real. I don’t think they’re authentic. I don’t think they’re good. I don’t believe them. In this instance, I absolutely believed what I read. Matthew Winkler recently returned home after a nine-month long, fifty-state odyssey with his son, Logan. 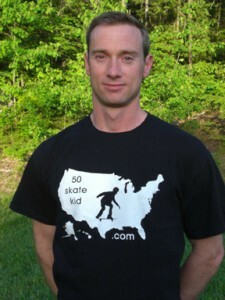 They maintained a blog during their travels at 50skatekid.com. Matt is completing a book about their epic journey while teaching English at South Kent School.